There’s a fight brewing in the Pacific about toxic algae, climate change, and crabs. It has the commercial crab industry squaring off against Big Oil. So for our latest article in science, I took some motion-sickness meds and hopped on a boat to find out what’s really threatening commercial crabbing and what can be done about it. At the heart of this fight is a neurotoxin called domoic acid, which causes something called amnesic shellfish poisoning. The symptoms can range from stomach problems, confusion, short-term memory loss, seizures, and even death. For three of the past four years, elevated levels of the toxin have forced California’s commercial crab fishery to stay closed for weeks to months past the usual opening day until the levels drop. Domoic acid is produced by algae that bloom regularly along the Pacific coast. These blooms aren’t always dangerous. There’s some combination of nutrients, light, and, perhaps most importantly, warm water that can create a toxic soup. The toxin travels up the food chain from filter-feeding shellfish to creatures like crabs, marine mammals, and, rarely, to humans. To keep the food supply safe, state officials close fisheries when levels get too high. Crabs and crab pots on the Karen Jeanne. These closures have been devastating to the Dungeness crab industry, as many publications, including San Francisco Magazineand National Geographic, have reported. The worst closure started in 2015 and lasted for months, costing the industry more than $48.3 million by one estimate and upwards of $117 million by another. The 2016 and 2018 seasons also saw domoic acid delays. An organization called the Pacific Coast Federation of Fishermen’s Associations is bracing for a future where climate change ensures that there’s plenty of that key ingredient for toxic blooms: warm water. These fishers have connected some worrying dots, from the toxic blooms and warming oceans to climate change and fossil fuels. So the group has taken the extraordinary step of suing 30 major fossil fuel companies: it wants Big Oil to pay for the harm to members’ livelihoods, and they want their industry to survive even in a changing climate. Although the lawsuit does not specify a damage amount, the federationestimates crab fishing contributes hundreds of millions of dollars to the economy in Oregon and California each year. “We’re out fishing all the time, and it’s obvious the oceans are getting warmer,” said John Beardon, who fishes for Dungeness crab out of Crescent City, California. “That’s bad for crabs and other fish, and it’s bad for those of us who make a living on the water. 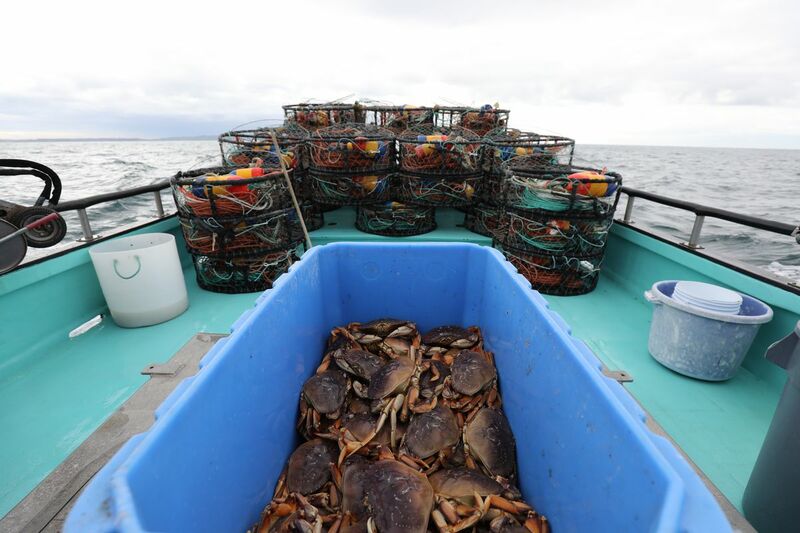 The crab fleet is responsible for thousands of jobs on the boats and thousands more in the local businesses that support the fishery, according to Noah Oppenheim, the Pacific Coast Federation’s executive director. The federation’s lawsuit adds to a growing list of municipalities that have turned to the courts in the last two years seeking to hold fossil fuel companies financially responsible for the threat posed by climate change. The fossil fuel companies’ legal teams have pushed back hard, and judges have dismissed some of the lawsuits, saying it’s not up to the courts to decide climate policy but rather the job of the legislative and executive branches of the federal government. “This case will face similar obstacles as the other cases,” said Michael Burger, executive director of the Sabin Center for Climate Change Law at Columbia University. Beyond the lawsuit being filed by a private party and the particular harms cited to the crab fishing industry by warming oceans, the complaint appears to similar to other climate litigation, he said. “Instead of working to reduce the use and combustion of fossil fuel products, lower the rate of greenhouse gas emissions, minimize the damage associated with continued high use and combustion of such products, and ease the transition to a lower carbon economy, defendants concealed the dangers, sought to undermine public support for greenhouse gas regulation, and engaged in massive campaigns to promote the ever-increasing use of their products at ever greater volumes,” the lawsuit says.